Surprising most who followed all three practice sessions, Red Bull's Sebastian Vettel failed to pole for the Singtel Singapore Grand Prix. Instead, the pole went to McLaren's Lewis Hamilton who won the advantage over grid-mate Pastor Maldonado by almost one-half of a second with the times for the front row being 1:46.362 and 1:46.804, respectively. Vettel came up short with a 1:46.905 placing him third on the grid. This will be Hamilton's third pole position in four races. Jenson Button slid into fourth place ahead of the current Drivers Championship point leader, Ferrari's Fernando Alonso, who sits in third row next to Paul Di Resta with Force India. Vettel's teammate, Mark Webber, could do no better his second time out and starts at seventh next to Romain Grosjean who is slotted at eighth. Michael Schumacher and Nico Rosberg round out the top ten without posting a time for Q3 as both opted to begin the race on the Pirelli Super-soft tires so preserved their rubber for tomorrow's start. The rest of the field holds more disappointment for some drivers than others - especially Lotus' Kimi Räikkönen, who is third in contention for the driver's points lead. Räikkönen is just 38 points behind Alonso and will be sitting in 12th place next to Force India's Nico Hulkenberg who is starting at grid spot 11. Tune in to SPEEDTV on Sunday, September 23 at 7:30am ET as we monitor the weather and watch the running of this gorgeous nighttime Grand Prix that is unlike any other during the season. 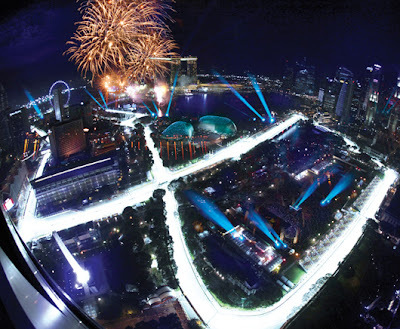 Here's 2012 Formula 1 SINGTEL SINGAPORE GRAND PRIX Live Stream and Results. On this page you can find the live live streaming action for the upcoming Formula 1 Grand Prix Singapore which will be held from September 21- 23, 2012.